What is the Status of the Manatee Population? As of the most recent aerial surveys in January 2018, there are at least 6,131 manatees in Florida. These aerial surveys are flown over manatee aggregation sites during the winter months when manatees gather in high numbers. Since the surveys started in 1991, the number of manatees counted during the surveys had increased, which is related to a growing population, improved survey techniques, and increased knowledge of where manatees aggregate. Synoptic survey counts do not provide statistical estimates of population size and thus are not supposed to be used to determine trends in the population. Rather, these surveys provide a minimum count of manatees. The outcome of the survey is highly dependent on weather conditions and factors including wind speed, glare, and water clarity (turbidity) affect the ability of researchers to count manatees, while the severity of the cold front determines just how many manatees are present at the warm water site to be counted . The manatee population in Florida is divided into four management units (Northwest, Upper St. John’s River, Atlantic, and Southwest). Runge et al. (2007) noted that the population of all four units is likely to decrease over the next few decades with the loss of warm water refuges . In 2017, the U.S. 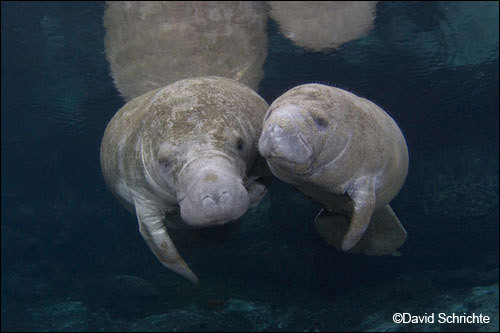 Fish & Wildlife Service issued its final rule to downgrade the status of the West Indian manatee from endangered to threatened under the federal Endangered Species Act despite the fact that the best available scientific data and legal standards indicate that downlisting at this time is inappropriate. Get the latest Synoptic Survey Results at the FWC Fish and Wildlife Research Institute website. Ackerman, B.B. 1995. Aerial surveys of manatees: a summary and progress report. In Population biology of the Florida manatee, edited by T.J. O’Shea, B.B. Ackerman, and H.F. Percival, 13-33. Information and Technology Report 1, U.S. Department of the Interior, National Biological Service. Runge et al. 2007. A core stochastic population projection model for Florida manatees (Trichechus manatus latirostris). U.S Geological Survey Open-File Report 2007-1082. 41 pp.